The QuickBooks Pro product has the capability of importing data from an external source. Data can include lists that correspond to QuickBooks’ lists, budgets, and individual transactions. 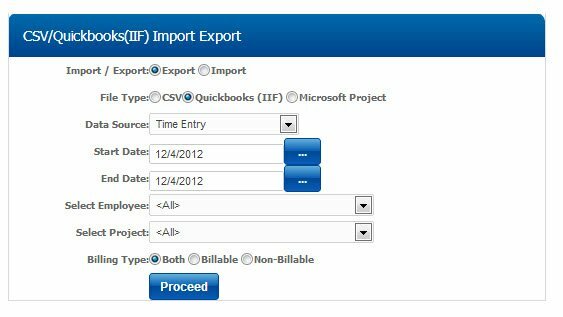 We will be utilizing the IIF imports to facilitate the importing of time data into QuickBooks. 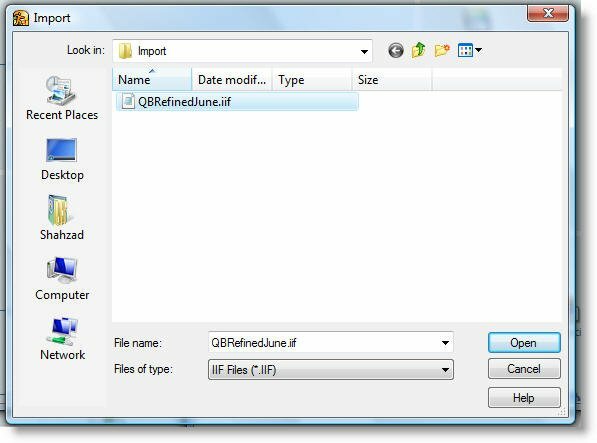 This is facilitated by creating a comma (or tab) separated file in a format that QuickBooks can understand (the QuickBooks IIF format). This format includes the use of column heading tags (keywords) and row heading tags to help identify the beginning and end of each transaction. When you are exporting the data out of TimeLive, in preparation for the import into QuickBooks, the extension given to the file is important. QuickBooks is expecting the file extension to be “IIF” or “iif”. When on the Export — Time screen, one of the options is to supply the output filename. You can at this point provide the appropriate the file name with IIF extension. Export Data from TimeLive in a Quickbooks ready format (IIF). 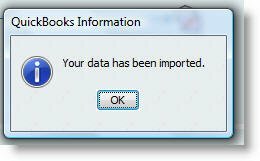 Import the exported time data into Quickbooks. 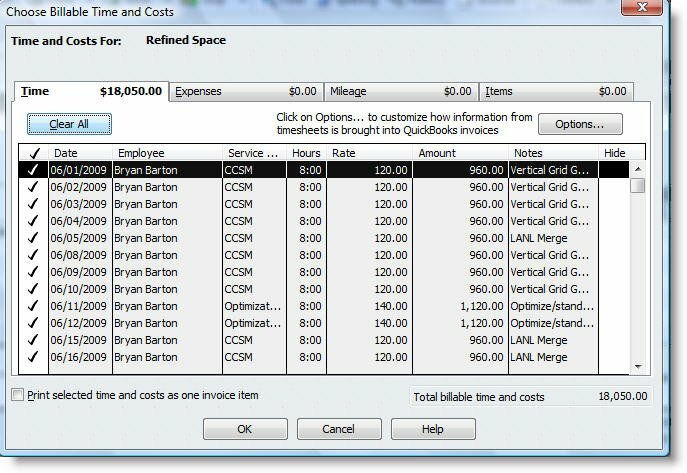 Define billing rates for [Items] in Quickbooks. 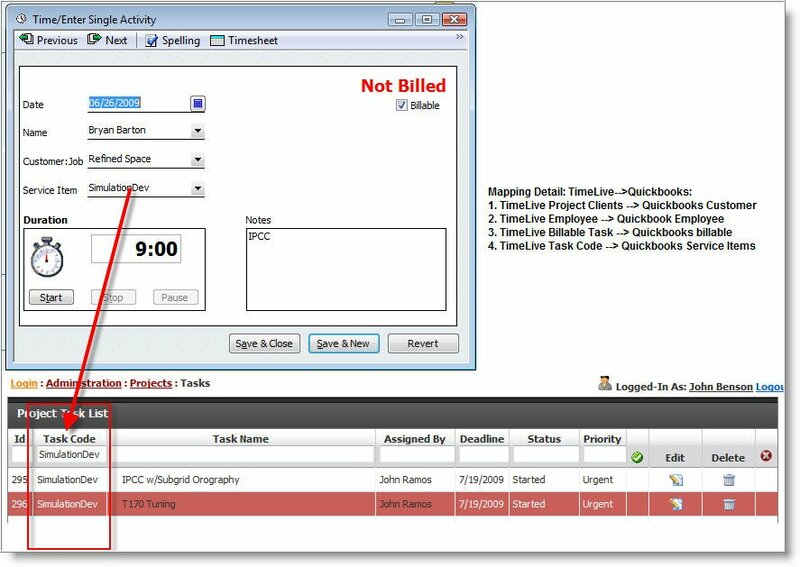 Generate an Invoice in Quickbooks based on imported TimeLive Time data. Navigate to [Admin Options] —> [Import / Export CSV/Quickbooks] in [Import/Export] section. Define your data export start date and end date. Select your project whose time entries you want to export. Now click on [Proceed] button. 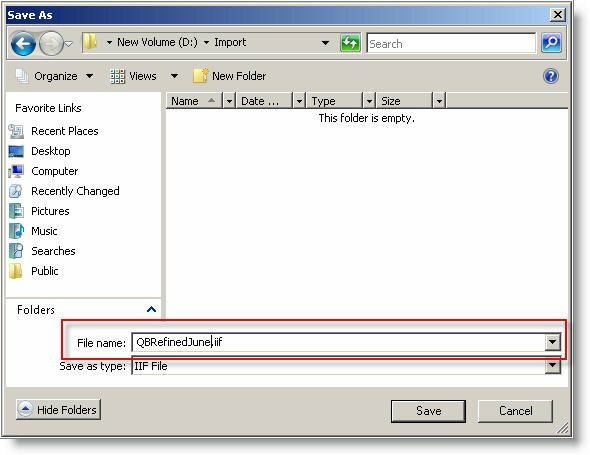 Give some best name for your exported IIF file and note down your IIF file saved location. This is end of exporting time data to Quickbooks IIF File. Step 2: Import the exported time data into Quickbooks. Select your exported IIF File in File open dialog box and then click on [Open]. Quickbooks will show completed messaged after import. Step 3: Define billing rates for [Items] in Quickbooks. Open [Customers] —> [Item List] in Quickbooks. 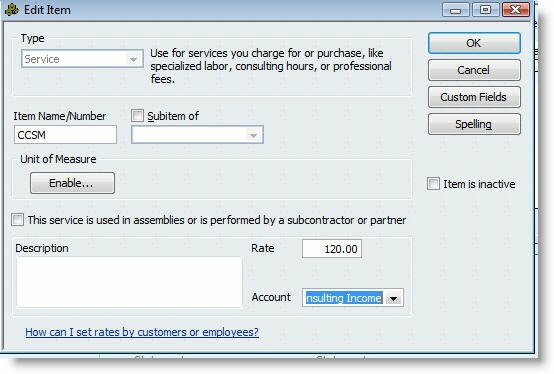 Define item’s [Billing Rate] and [Account] in Quickbooks. Click on [OK] when done. Define billing rate and Account of all TimeLive imported items. Open [Customers] —> [Create Invoices] in Quickbooks. Select your customer whose Invoice you want to create in [Customer:Job] dropdown. Quickbooks will prompt for importing all pending time and cost items. 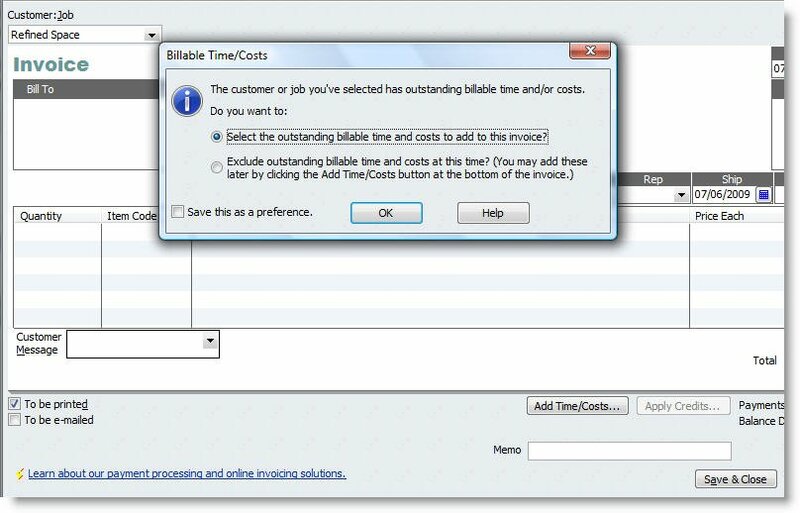 Click on [OK] to import all outstanding billable time and cost in Quickbooks Invoice. Quickbooks now show all outstanding billing items. Just click on [Select All] to select all time entries. Click on [OK] to import all selected time records in Quickbooks. 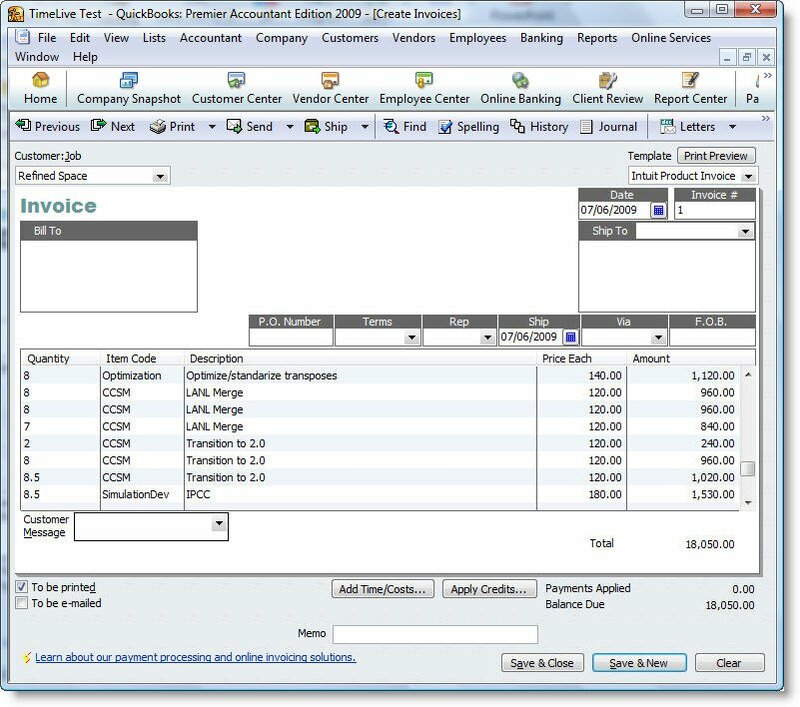 Quickbooks will import all-time records in Customer Invoice. An accountant can then proceed this invoice as per their own defined organization policies.